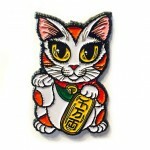 Maneki Neko Luck Cat - Collectible Enamel Pin - Luck kitty is in traditional tricolors (Calico, Tort..
Halloween Black Kitty - Collectible Enamel Pin - An adorable wide eyed black kitty peeks over the to..
Day of the Dead Cat - Collectible Enamel Pin - "Día de los Muertos Gato", Here's my black cat ..
Voodoo Cat Doll - Collectible Enamel Pin - A creepy cute patchwork Voodoo Cat Doll with three ..
Captain Leo - Collectible Enamel Pin - The brave pirate cat, Captain Leo sails the seas at sun..
Blue Dragon Kitten - Open Edition Collectible Enamel Pin - “Blue Dragon Kitten” with *GLITTER Wings & Silver Metallic Coin! 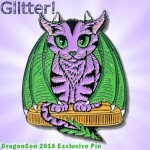 * was created as a variant of the "Purple Dragon Kitten" special pin created specifically for DragonCon 2018. 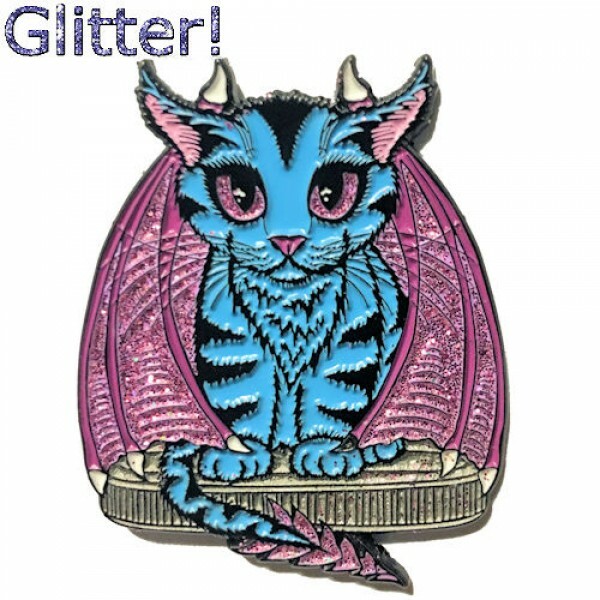 I wanted there to be a version of this cute Dragon Kitten that everyone could have. 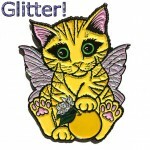 Tigerpixie Collectible Pins are soft enamel and metal pins. 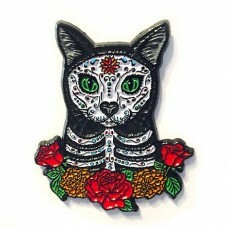 I personally redesigned my original artworks and chose the enamel colors to be perfect for each pin. 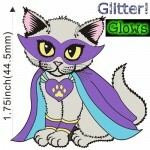 The pin sizes may vary and will be listed in the description of each individual pin. The pins have two secure "locking" backs to keep them from getting lost and keep them straight and in place. 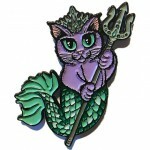 All of my pins are stamped on the back with the copyright symbol and my name, ©Carrie Hawks, Tigerpixie. Availability, I will have mostly Open Edition Pins and a few Limited Edition Pins that will be clearly stated in their descriptions. The Pins will come packaged on a backing board in a clear resealable sleeve and are mailed bubble wrapped in an envelope for protection. 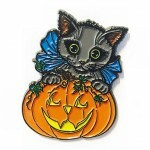 Limited Edition Exclusive Pins - With all of my Exclusive pins, I do make a few extras in case of loss, damage, errors, etc, and if they are not needed I give those away too in Giveaways to my Patreon Patrons – You can sign up here - Tigerpixie's Patreon to be included in these giveaways. 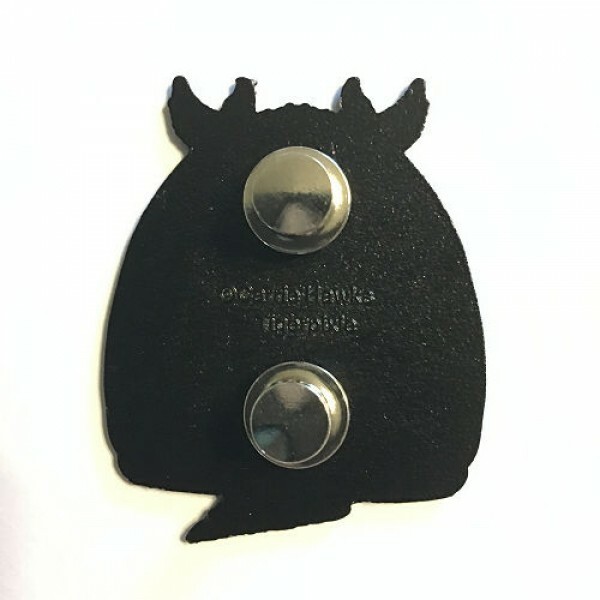 Help With The 2 Secure Locking Pin Backs - No tools are needed, To Remove the pin back squeeze with your fingers the middle barrel part of the pin back in between the top disc and the bottom disk and pull off. 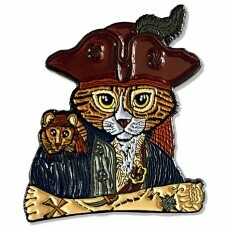 To Replace just slide the pin back on normally to re-secure and lock in place. Maneki Neko Luck Cat - Collectible Enamel Pin - Luck kitty is in traditional tricolors (Calico, Tortie & White) like the Japanese Bobtail cat. 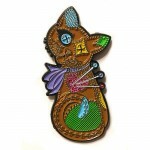 Wit..
Voodoo Cat Doll - Collectible Enamel Pin - A creepy cute patchwork Voodoo Cat Doll with three little pins stuck in her. 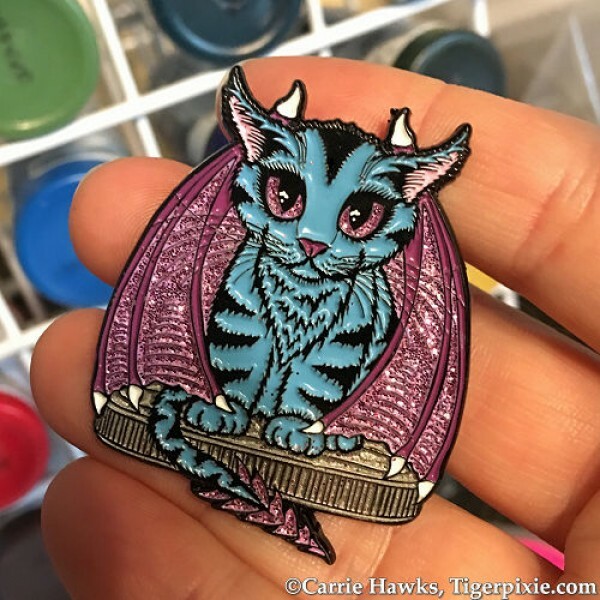 She's still as happy as ..
Purrseidon Purple - Open Edition Collectible Enamel Pin - The “Purrseidon” (Purple) was made as a variant of my Pensacon Orange Limited Edition ..
Purple Dragon Kitten- DragonCon 2018 Exclusive - Limited Edition Exclusive Collectible Enamel Pin - “Purple Dragon Kitten” with *GLITTER Wings & ..
Holiday Kitten Boy - Collectible Enamel Pin - An adorable snow white kitten peeking out of a festively wrapped holiday gift. 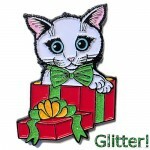 This pin has Glitte.. 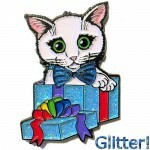 Gift Kitten Boy - Collectible Enamel Pin - An adorable snow white kitten peeking out of a colorfully wrapped gift purrfect for any occasion. 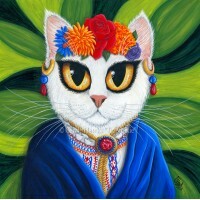 Thi.. 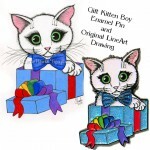 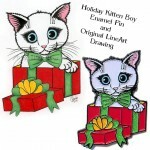 Gift Kitten Boy - Original Linework Drawing and Enamel Pin Set - This is my original pen and colored pencil line work drawing I created for my c..
Holiday Kitten Boy - Original Linework Drawing and Enamel Pin Set - This is my original pen and colored pencil line work drawing I created for m..
SupurrKitty Purple - PREORDER - Open Edition Collectible Enamel Pin - “SupurrKitty Purple” with *GLITTER Cape & Mask and Glow In The Dark Yellow A..